Ok!! So I never heard back from Kelly as my camera dilemna blog candy winner. I have picked another winner! Babe O'Mara! Come on down! Email me your info and I will get your goodies out to you!! I have a winner to my mega blog candy giveaway!! And speaking of blog candy winners, KELLY!!! WHERE ARE YOU? You are the winner of my camera dilemma blog candy!! If I don't hear from you today, I will pick another name. 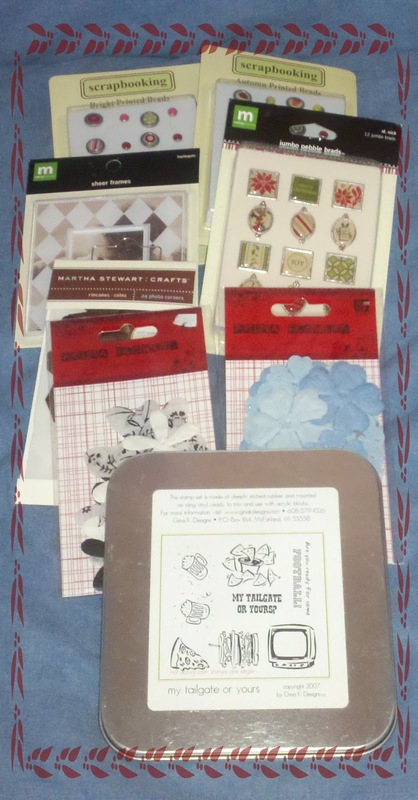 So generous of you to share these crafty goodies. I'm a follower of your blog. Wishing you all the best and thanks so much. YVONNE!!! Come on down! Send me your addy and I will get your goodies out to you! Thank you all for playing along and for those of you who are a new follower, thank you and welcome!! Great thoughts. I have a digital slr canon and I love it! I highly recommend it! Kelly... Please send my your addy and I will get your goodies out to you!! Thank you everyone for your input and for playing along!! There is still time to win my other blog candy giveaway so be sure to check that out! Thank you to everyone who has given me so much input about thier favorite camera!! I have gotten some idea of which camera I want and now when dh and I can sit down together, we can discuss it!! Thank you sooo much!! Today I would like to share with you two projects I did for Amate Studios in the theme of The Chinese New Year. This is the year of the rabbit, although, I have nothing to do with a rabbit in my project! LOL! The first project was using Amate Studios oval linked bracelet and a picture of a Chinese dragon. My idea was to make it look like a dragon in motion. I punched out the picture using EK Success oval jewelry punch and topped it with Lisa Pavelka's Magic Glos. The second project took a little more time and a little help from the hubby. I wanted to use the Chinese coins within a pendant but still be able to string it through as the Chinese do during this holiday. I used some bulk link chain with some dragon beads strung through and knotted around the red rat tail holding the coins. For the center pendant, I glued the coin into the pendant and then punched a hole using my Crop-a-dile. I kept punching until I got it as sqauare as possible and then filed through to make it smooth. I did not want the top part of the pendant, so I asked my husband to cut it off and smooth it down with his Dremel. It worked out well and certainly made for an interesting piece! Well, that is about it for today! There is still time to enter my two blog candy giveaways! Scroll down one post... Thanks for stopping by and I hope you all have a great Friday! Random Thoughts and More BLOG CANDY! First off... thank you to everyone playing along in my Blog Candy giveaway!! If you have not seen the mega candy, you can here. Today, I just had some random thoughts I thought I would share. And I wouldn't even mind some input!! Why your input? 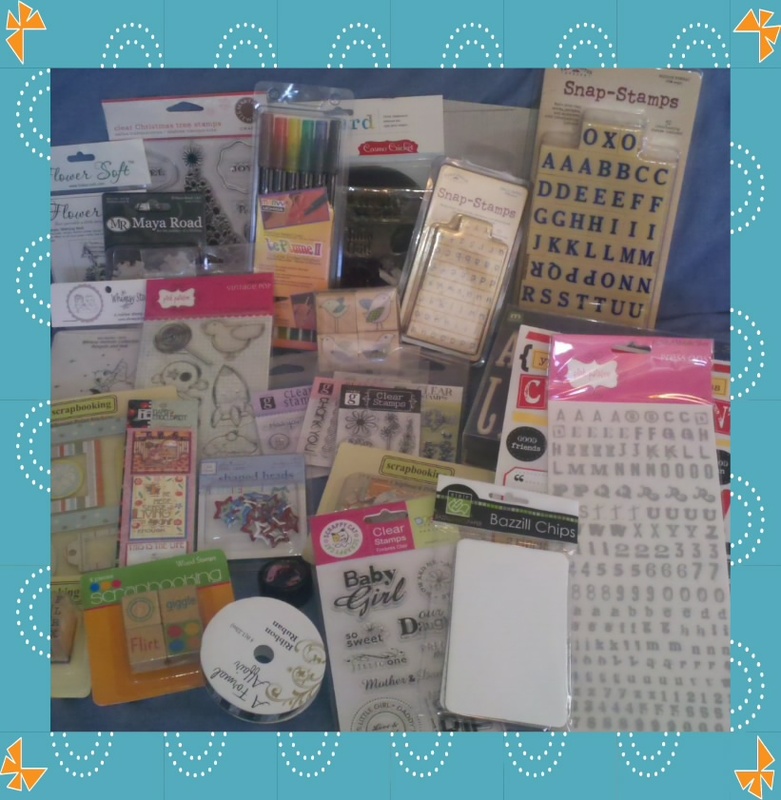 Because you can win MORE BLOG CANDY!! :D What's in it? Some Prima Flowers, Epoxy Brads, acrylic frame, and a Gina K set called My Tailgate or Yours? Perfect for the upcoming Super Bowl parties!!! Random thought #1....So, let's start off with cameras! Now, you all know I have been without a camera for some time now. Let me share with you my camera saga! I had a wonderful point and shoot Canon since my kids were born, which had been dropped, played with by the boys, seen crazy pictures taken by my boys that no poor camera should see (LOL), and used on just about every vacation we have taken!! That particular camera finally had enough a little over a month ago. Last Valentines, my dh bought me a new camera while deployed to Iraq and it was wonderful!! Then about 6 months later, while sitting in my craft room, I am hunched over with the kids getting ready to take a picture, when it slipped and drops about 1-2 feet onto our hard floors. Kaput! The camera refuses to work. I contacted the company to see if they would fix it since it was still under the warranty, but being the honest Abe, I mentioned I dropped it. Well!! The warranty is now void because of my negligence. It was not worth trying to fix as it was cheaper to buy a new one. So, I went back to using my trusted Canon. Now that my trusted Canon decided that it has had enough, I am in the market to purchase a new one. DH and I love the SLR cameras, but they don't take video, which we like to do if our video camera is not with us. We are minimalists to where if we travel, we just like to bring only what is really needed. You don't always need video, but we like having the option. We are now back at looking at some point and shoots. We love Canon, but can't help looking at Nikons. My question to you is, do you have a favorite brand or camera or did you receive a new one over the holidays that you can kindly share your thoughts about? The hubster and I really need to get going on this but can't seem to agree on which model. Really?! As if this is rocket science... LOL! Random thought #2.... Did I really think I could get my two 8 years olds to sign thier own Thank you cards to send out from Christmas? Yeeeaaahhh.... For a brief moment, I must have been living on another planet. So, I finished them off this morning and signed thier names. Random thought #4.... I am supposed to travel for a girls weekend tomorrow... here's to clear skies (HA! It's suppose to rain here...) and clear runways- For all the girls meeting up! I hope you all have a wonderful Thursday and tomorrow I will have an Amate Studios Project to share with you all! The theme... Chinese New Year! I hope you all are having a nice long weekend with your family! I am still without camera but realized (DUH!) that I can use my phone! Soooo.... I just wanted to pop in to share with you some mega blog candy I am giving away! 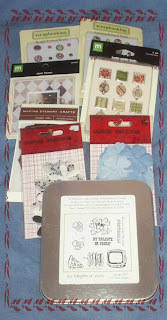 I am cleaning house and slowly downsizing my craft area so there are some really great items in here! You will get some Karen Foster Snap Stamps, Le Plume markers, Flower Soft stamp, Maya Road chipboard, ribbon, embellies, Pink Paislee, MS Stamps, Cosmo Cricket Blackboard, Hero Arts stamps, and a lot of other things!! THAT'S IT!! I will pick a random winner January 28!! I will have more candy as I clean house so you will have other chances to win! Good luck!